rec. dates and location not given. Louis Demetrius Alvanis is doing sterling work for the Meridian label, and has numerous releases to his name. The Chopin solo piano sonatas are frequently coupled with other flotsam rather than gathered together on one disc, and with the less frequently recorded Sonata No.1 this is a useful programme. Meridian have ‘A Natural Sound Recording’ approach and marketing hook, but the recording of this disc is one hurdle some listeners will have to leap before considering purchase. I searched high and low, but other than mention of the Steinway name, I could gain no clues from the disc packaging as to where this recording was made. The piano sound is very good, and from my own point of view I have few complaints, but it has to be said that the acoustic here is somewhat swimmy. The effect of this varies – I found it rather hard to live with on the car stereo, less disturbing over headphones. If you live in a palatial space with marble floors the combined echoes may make this less than favourable, but as a ‘concert hall’ kind of recording it can be quite exhilarating. You’ll need to make up your own mind, but have a listen first if you can. The best known Chopin sonatas are numbers 2 and 3, and my reference here is Evgeny Kissin on RCA. His playing is by no means all things to all people, but if you want a passionately expressed view by which to compare others then his is pretty emphatic. The Sonata No.2 opens with one of those highly dramatic statements, and there’s plenty of ‘symphonic’ piano writing to get your teeth into. Alvanis’ contrast between this and the beautifully lyrical second section isn’t quite as wide as with Kissin, but everything is nicely phrased and punchy enough. Where Kissin is stronger is in his sense of a kind of vocal narrative – expressing the sheer melodrama in the music. The remarkable modulations later on in the movement are more muddled and less immediate with Alvanis, still with plenty of power and texture, but with less ‘wow’ factor leaping from the composer’s imagination as much as from the piano. This dramatic flavour is taken further in the Scherzo, which again has plenty of weight and contrast from Alvanis, but with Kissin’s wider dynamics the music reaches further beyond the salon walls, at times approaching a kind of cinematic mad genius feel. Alvanis’ warmth of lyricism later on is highly atmospheric, more nostalgic than extrovert and the more appealing for that. The famous Marche Funèbre is one of those movements which can run the risk of becoming too over-laden with symbolic feeling, and Alvanis gets the balance right in my view, moving the pace along and not stopping to pick grief-blackened lilies on the way. Kissin has a tendency to explode in gestures of Greek tragedy which can have its own power, but wears a little heavy after a few hearings. The wonderful central melody can be seen as a kind of ecstatic arrival in heaven, as with Kissin, or a consoling embrace from a close friend or family member, as with Alvanis. The remarkable Finale is done by both pianists in almost exactly 1:30, Alvanis almost secretive with those runs, Kissin pedalling them into a Turneresque storm scene. The Sonata No.3 is thematically more coherent as a piece, and as Alvanis point out in his well written notes, a product of his most mature style. His melodic expression is beautifully turned, with nicely proportioned rubato and a fine sense of poise and colour in both the upper voice and accompaniments. Kissin’s recording wins in clarity, which makes a difference in some of those remarkable pedalling effects in the first minute, after the opening theme statement. This extended movement is like a vast ornate carpet of recurring patterns and an amazing variety of shapes and forms. Kissin has a tendency to milk some of these for all they’re worth, virtually stopping at times. Alvanis has a greater sense of continuity and connectedness, his more constant forward momentum allowing time for reflection, but without bringing us to disorientating red traffic lights and difficult junctions. Another one of those finger-busting etude-like gestures, the opening of the Scherzo is one of those moments all good pianists must relish. Alvanis’ technique is well up to all this, and I also prefer his more sober presentation of the second section, another moment where Kissin has a tendency to muse and wander. Sensitive to the relationship the Largo movement has to Chopin’s friend Vincenzo Bellini, Alvanis is beautifully lyrical, and more believably singable than Kissin’s more pianistic line. This is hard to define, but at a basic level Alvanis plays the melody more softly, integrating it more effectively with the warm bed of harmonies which accompany. The section about 3.00 in is also quite magical; unlike Kissin, Alvanis avoiding pointing out melodic notes which aren’t really there. The Finale is another grand statement which has both plenty of pianistic fireworks and compositional marvels to offer, and I have no complaints about Alvanis here. He avoids making the more banal ‘rumpty-pumpty’ moments sound crass and is pretty convincing throughout. Kissin and Alvanis differ a little in tempi, the former shaving about 20 seconds from Alvanis’ time, the latter however not sounding at all relaxed and building a fair amount of excitement, the only marginal problems being a piano which sounds as if re-tuning in the mid-upper range was on the cards by this stage, and the rather milky acoustic, which the sheer amount of notes does penetrate, but sometimes requires a little ‘through’ listening. Not to short-change the Sonata No.1, but while this student work has plenty of fine features it is somewhat dwarfed by the other two pieces. It serves as a nice warm-up to the other sonatas, and allows the ear to become accustomed to the sonic picture. 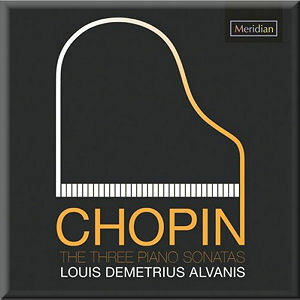 Alvanis is sensitive to the kaleidoscope of influences Chopin was absorbing into his compositional work in this period, and his clear talent and facility for writing for his own instrument comes through with no holds barred. Funnily enough, it is only in the presto Finale of this sonata that I had the feeling that Alvanis was being pushed in any technical sense – Chopin’s tough pianistic writing making maximum demands with very little let-up at high speed. Despite the wealth of riches when it comes to resonance in the recording, this is a very fine Chopin disc and can hold its own amongst the best. The classic recordings of the two great sonatas by Martha Argerich and Maurizio Pollini, both on Deutsche Grammophon, still hold a pre-eminent place. These and Artur Rubinstein’s great 1960s RCA recording will always have a special place, and Vladimir Ashkenazy’s Decca disc of all three sonatas as the direct competition for this programme is also pretty hard to beat. Fans of this music who just can’t get enough will find a good deal to enjoy here, and even though it may not quite be that last word in Chopin’s three piano sonatas it is most certainly a worthwhile contribution.